This past Wednesday, Albie O’Connell was introduced as BU’s head hockey coach to university officials, the media and other guests at a press conference at Agganis Arena’s Francis Burke Club Room. 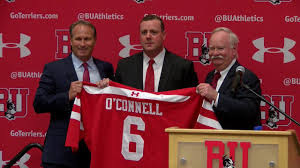 O’Connell was introduced by University President Robert Brown and was joined by his wife Kristen—also a BU alum—and their three children. His immediate task is to replace himself as an assistant and O'Connell indicated he has several names in mind. For the third consecutive season, a Terrier will have his named engraved on Lord Stanley’s famed Cup. Two-time BU scoring leader Alex Chiasson and the Washington Capitals defeated Las Vegas 4-3 last night to complete their march to the NHL title and earn the right to raise the Cup. Chiasson, who scored 18 points this season for the Caps, becomes the 13th Terrier to have his name inscribed on the Cup. Jeff Cox reports on 2018 recruit Joel Farabee who is expected to be the first skater from New York to be selected in this month’s NHL Entry Draft. Two future Terriers will be playing this summer in the Chicago Pro Hockey League along with pros from the NHL, AHL and ECHL. 2019 recruit Vinnie Purpura is skating for Team Orange and Alex Vlasic will play for Team Blue. Purpura, a goalie who was ranked at #23 among North American goalies for the upcoming draft by Central Scouting, played for USHL Omaha, while Vlasic, a defenseman, played for the NTDP U17s. 2020 recruit Donovan Sebrango has been invited to Canada’s national U17 development camp. Last season, the 6’0” left-shot defenseman scored 25 points for CIHA White Midget AAA as a teammate of fellow 2020 recruit Dylan Peterson. Selects Academy forward Josh Lawrence, who had been a 2020 recruit, has decommitted and signed with St. John of the QMJHL, who had drafted him in the first round of the league draft. 2021 recruitsTyler Boucher and Jeremy Wilmer participated in last week’s Liberty Bell games.